Make a healthy dinner with this summer quinoa salad packed with fresh herbs and vegetables like parsley, cucumbers and bell peppers. Let’s celebrate the best time of the year with a recipe for summer quinoa salad. What makes this a great recipe for summer? Well the fresh basil, fresh parsley and fresh tomatoes of course. When there is fresh produce available, it’s all I want in every single recipe. OK, so it’s not quite tomato season yet but still, tomatoes just scream summer to me. And by the time you’re making this quinoa recipe, maybe tomatoes are in season. I love quinoa salad and this recipe is super simple because it just uses my basic balsamic vinaigrette for a dressing and some fresh veggies you probably already have in your fridge, nothing fancy, but it’s good, healthy food. The kind I find myself craving all summer long. 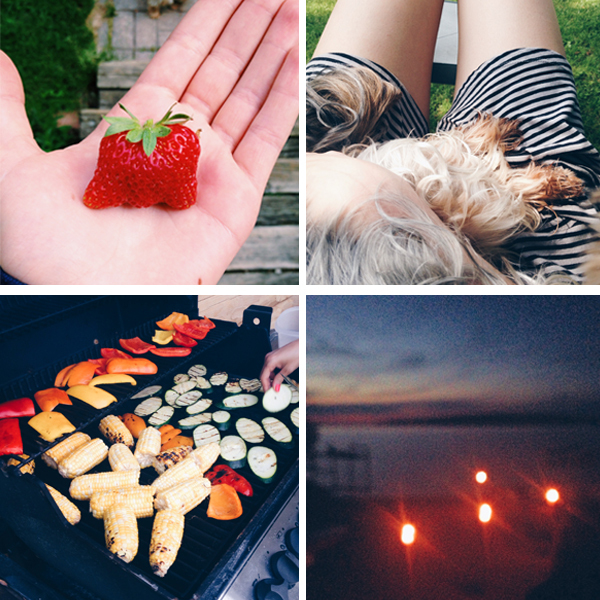 Just few snapshots from my summer from my Iphone. I spent a huge part of Friday and Saturday doing some much needed editorial planning for Living Lou. Coming up with new recipes and ideas is a really fun process but it’s also just that, a process that can be somewhat overwhelming. Sitting down and planning months of recipes, thinking about what is in-season, what people are searching for and finally what people will want even though they just don’t know it quite yet. Sometimes I wish I had a whole team to bounce ideas off of, but alas, it’s just little old me. I’ll bounce ideas around with my family members and a few of my close friends, but most of the time everything you see on here is all me. At the TV show I worked at until January, we would have these great editorial planning meetings and I learned so much in those meetings. Everyone would throw out a bunch of ideas and we would discuss and come up with new ideas from those discussions. I always found that when we put our heads together the ideas were that much better. Watch my video below for a quick for the easiest way to peel ginger. 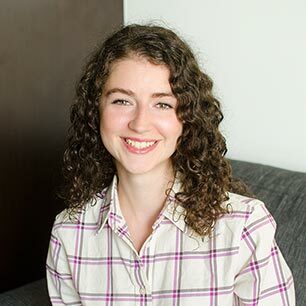 Writing a blog and creating content is quite a solitary process, I’m lucky that my family is incredibly supportive and helpful (and are also my make-shift editorial and management team). So now, after a couple of days of intense planning and brainstorming, I’ve got some great content and recipes ready to start testing. Let me know if there are any specific recipes you’d like to see more of on here! Other than editorial planning, my summer has been pretty fantastic, filled weekend getaways and a little more planning. But this time for something a little more exciting, my European adventures with my sister. We’ll be jetting off to take the eurorail and explore some of our must-visit spots, be sure to follow along on the blog and Instagram for more snapshots and a behind-the-scenes look at Living Lou. And now, as promised, the recipe for summer quinoa salad – let me breakdown the recipe for you. Packed with the flavours of summer, this quinoa salad recipe is filled with fresh herbs like basil and parsley and summer tomatoes. A light fresh salad perfect for summer. Cook quinoa according to package directions, about 12-15 minutes. 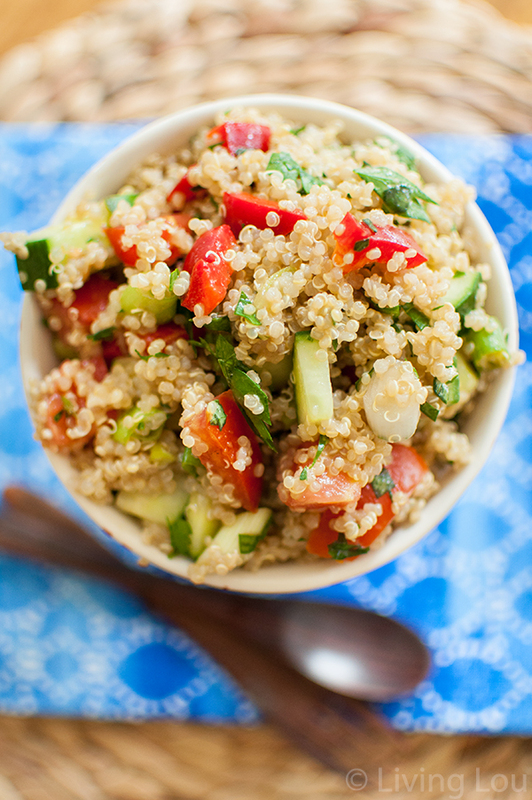 Mix quinoa with tomato, red pepper, green onions, parsley and basil. Let me know if you give this summer quinoa salad a try in the comments below. Thank you, Allison! I've had to do some holiday recipe work in June/July also and it's so bizarre! But planning is definitely important and I think I'm starting to finally get the hang of it. Oh, planning blog stuff is SO time-consuming, but so worth it once you get it all done! I so know what you're talking about. ;) And I LOVE fresh, summery salads! This quinoa looks amazing, Louisa! So fresh and tasty-looking. Gorgeous photos too! It definitely is a lot of fun, otherwise why would we do this blogging thing? Haha!